When the weather becomes cooler I start thinking of baking. One of the easiest recipes is a recipe for No knead bread. Yes I said no kneading required. The top photo shows step one. 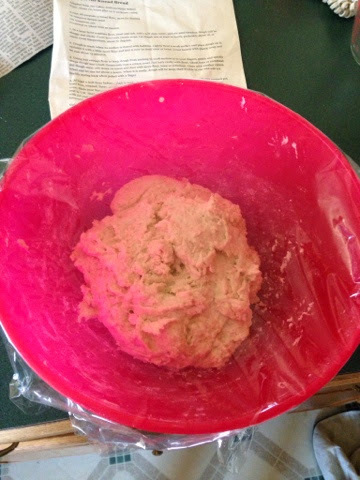 First in a large bowl combine 3 cups all-purpose or bread flour, 1/4 tsp. 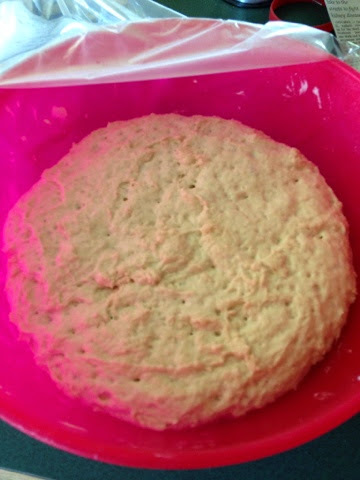 instant yeast, and 11/4 tsp. salt. Add 15/8 cups water warm but not hot. Stir until all ingredients combined. Cover with plastic wrap and leave in a warm place to rest for roughly 12 hours. 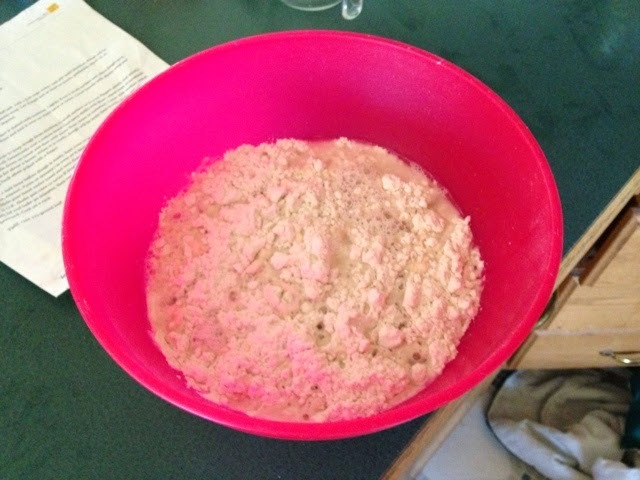 The photo below shows the mixture at rest. After 12 hours more or less it will have risen and will look fluffy. At this point what I did changes from the initial recipe instructions. Original recipe and instructions here.I then heat the baking vessel(which should have a lid and could be cast iron) in a 450 degree oven. After the oven has heated with baking vessel inside I sprinkle cornmeal in the vessel and coat my hands. 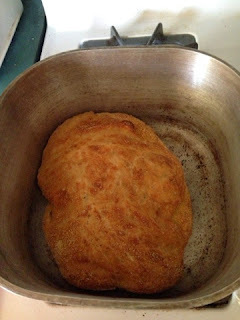 I more or less flop the mixture in the pan cover with the lid and place in the oven. I bake covered 30 minutes then I remove the lid and bake for another 15 minutes. When finished baking should have a nice golden brown color. This is great with simple butter or with herb butter. Herb butter- add fresh minced herbs a tablespoon to a 1/4 cup of soft butter. Stir, the flavors to enhance the butter. My husband prefers Italian seasoning added to olive oil to dip the bread into. This is a great recipe to start your baking this fall. Yum. I will try to highlight more bread recipes this fall...stay tuned.